Placing the ink on the roller. You have to be careful not to put too much ink, and also to make sure the ink is evenly distributed on the plate. With less than three months until the big day, we’ve I’ve been super busy hammering out all the fun details. Like many couples, we’re on a budget and I’m totally about DIY when it comes to a lot of the wedding stuff because I enjoy being creative and crafty, plus you can certainly save a few bucks! After first being introduced to Signal-Return while browsing Eastern Market one Saturday morning, I stopped in to learn more about possibly making our own letterpress wedding invitations. With the help of Signal-Return’s amazing Printer in Residence, Ms. Lee Marchalonis, we were able to create the most beautiful invitations that are uniquely our own. We learned so much along the way and we couldn’t have done it without her guidance and expertise – thank you again, Lee!! Design your invitations: I looked to sites like Pinterest and Etsy for inspiration and created our own design in Photoshop. Remember to stick to standard sizes so you have envelopes to put your invitation in. Order your paper and envelopes: The folks at Signal-Return introduced me to French Paper, which is a family-owned and Michigan-based paper mill. We chose the Madero Beach paper in 140 lb. I highly recommend stopping by SR to look at paper samples before you order because many of colors look differently online. For extra savings, we ordered the larger size so we could print several pieces of our invitation on one sheet of paper. I also chose a heavier stock to show the debossing of the text more (tip: letterpress does not necessarily mean you’ll feel impressions on the final piece – some letterpress shows little or no impression). Set up guided shop time: Sign up for guided shop time ($45 per hour) where you’ll get to work directly with Lee and she’ll show you the ropes of setting up the press, choosing your ink (you get to mix your own color! ), and the actual printing process. She was there to instruct us and answer questions, but we were definitely doing the dirty work of creating the invitations, which was very cool. Overall printing took us about 3.5 hours. Measuring your invitations: As I mentioned above, we set up our plates so we could get four pieces on one plate (the invitation, two versions of the response card and a guest info card). While this saved on some production costs and paper, it also meant we needed to cut each of the pieces to the right margins. Drawing straight lines and getting the margins just right was what I consider to be the challenging part of the whole process. But then again, math isn’t my strong suit. Cutting your invitations: Once your lines are drawn you get to use the guillotine (yes, it’s called a guillotine!) to cut your invitations to your envelope size. There’s a little pressure when it comes to pulling the handle down upon your masterpiece after you’ve put in so much work (I kept thinking: what if I cut it wrong and ruin it!). Don’t worry, the machine prevents the paper from sliding and creates a very straight, clean cut. But we didn’t just have a couple cuts. Each piece had four edges to be trimmed..times four pieces…times 150 sets. Needless to say my arm got a workout. I actually hired Lee to finish the rest off for me after exhausting my bicep within two hours. Making sure they (actually) fit in the envelopes: Picking up our invitations was so exciting! It was such a cool feeling to see our concept come to life in a way that we could see, hold and share with our loved ones. Once we brought the invitations home we made sure they actually fit in our envelopes (they did, whew!). Then of course came the stuffing, labeling and stamping of each set. I would highly encourage brides-to-be to consider printing lettepress invitations at Signal-Return. Just be sure to leave enough time for designing your piece, shipping the plates, ordering paper, cutting, etc. I’d say it’s not really something you can do on the fly. Here is a look at our experience with DIY letterpress wedding invitations. I had absolutely no experience with letterpress prior to working with Signal-Return, so thank you again Lee for all of your help! Mixing our own ink. It can get messy! Setting up the letterpress machine before printing. Lining up the plate on the grid is important, or your invitations could be angled slightly (don’t worry, you can fix it when you cut). Placing the ink on the roller. You have to be careful not to put too much ink, and also to make sure the ink is evenly distributed. My job was to feed the paper into the letterpress. Having a partner in the process helped us develop an efficient system! Finally done printing! See all the pieces on the drying racks next to us? After they are dry comes the not-so-fun measuring and drawing of the mark-up lines for cutting. 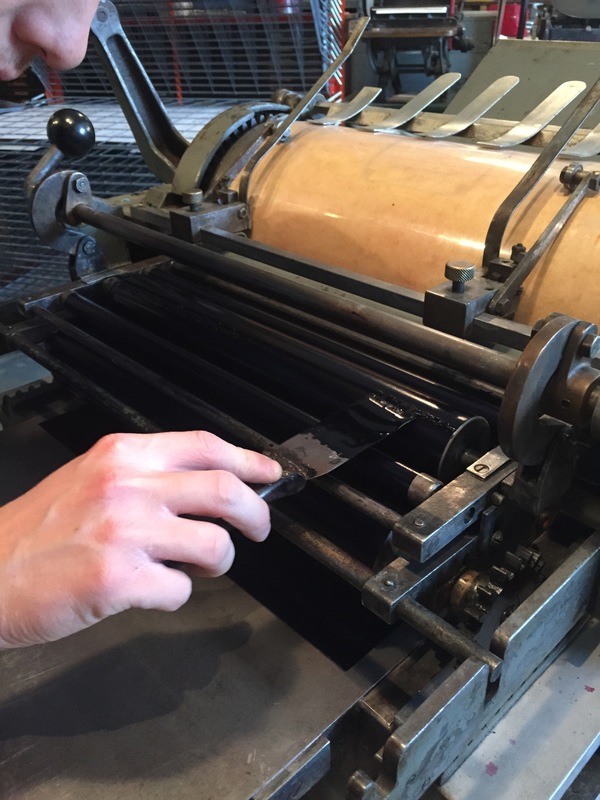 The Skinny: Making your own letterpress invitations is an amazing and fun experience, but it can be a lot of work. If you’re not the kind of bride who is willing to invest time, this might not be the best option for you (you could always have them printed for you at Signal-Return!) In terms of cost, there was definitely a savings for us compared to buying quality letterpress invitations, but if you’re looking for quick and dirt cheap invites this is not the answer. Signal-Return is located on Division Street in Eastern Market. Stop by to learn more about what they do or visit www.signalreturnpress.org. Categories: Entertainment | Tags: Detroit, DIY wedding, letterpress | Permalink. This is really awesome and the finished product looks great! I wish I had known this was an option for my wedding! Thank you so much, Stefanie!